Reading the Fantastic Four comics from the start. Although annual #3 is a historic issue which more or less permanently changed the course of the entire series, not a lot happens in this one. There’s a ton of fighting, then a wedding. It’s a quick read. As you can tell from the cover, the goal here is to get as many Marvel characters into one book as possible. We begin with Dr. Doom reading the newspaper, irate over a story about Reed and Sue’s upcoming wedding. Doom, still irate over his being beaten silly in his last encounter with the FF, whips up a new invention, an “emotion charger.” This thingie magically stirs the entire supervillain community into frenzy, causing every masked baddie to decide to attack the FF at once. Nick Fury and a bunch of SHIELD agents are at the Baxter Building, providing security for the wedding. (How many the country’s secrets are being sold to foreign enemies while all these spies are at a wedding?) A guy shows up and tries to poison the Thing, and it’s revealed this guy is under the control of the Puppet Master. Before we can process this, the Mole Man and his subterranean servants attack, and it’s on. The whole rest of the comic is basically one fight scene after another. Did Stan Lee think that the typically all-male comics readership might not be interested in a wedding issue, so he overcompensated with a nonstop onslaught of superhero battles? Or maybe he and Kirby just decided it would be fun to have all their characters in one story. Who knows? The X-Men versus the Mole Man and his henchmen. Dr. Strange versus Red Ghost and the Super Apes. Thor versus the Super Skrull. The Avengers (current lineup: Captain America, Iron Man, Thor, Hawkeye, and Quicksilver) and Spider-Man versus the Mandarin, Black Knight, Kang, the Mad Thinker, the Awesome Android, the Grey Gargoyle, Cobra, the Executioner, and the Enchantress. Daredevil versus the Black Knight. The X-Men versus the Mandarin, Electro, the Unicorn, the Beetle, and the Melter (I think they’re running out of bad guys by this point). Quicksilver versus the Human Top (now they’ve run out of bad guys). If all this wasn’t enough, then undersea warlord Attuma comes out of the sea with an army of ticked off Atlantis soldiers. I guess this is enough of a problem for the Watcher to interfere. He takes Reed on a tour of the fourth dimension (?!? 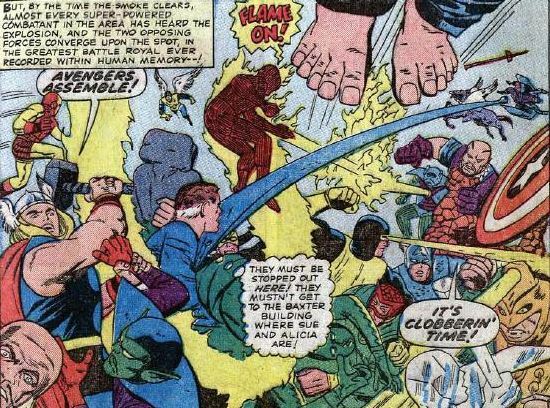 ), and he gives Reed a wondrous device that will allow Reed to remove memories from Doom and the other villains, giving them no recollection of these events. It works (I guess none of this was on the news), and everything goes back to normal. Time for the wedding. Sue is decked out in a nice white dress, but the other three FFers are just in their costumes. Break out the tux, Reed! Alicia is Sue’s maid of honor, and The X-Men and a couple of the Avengers are also in attendance, with Nick Fury and the SHIELD guys still working security. At the end, we see the SHIELD agents turn away two “party crashers” who insist they belong at the wedding. 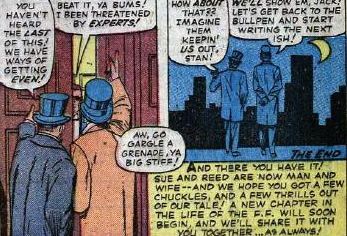 In the final twist, these two are, in fact, Stan Lee and Jack Kirby. “Let’s get back to the bullpen and start writing the next ish!” Stan says. Unstable molecule: Reed saves the say with a memory-erasing device, very similar to the one he used to outwit Dr. Doom in annual #2. Fade out: Sue sits out most of the issue, as she’s preparing for the wedding, leaving it up to the men to run around and punch criminals. How much fun would it have been for her to be in the full-on wedding dress battling the Beetle or the Melter? Clobberin’ time: Ben can be seen crying at the wedding, the big softie. Flame on: Johnny can be seen flying around during some of the fighting, but he kind of gets lost among all the guest stars. Trivia time: Spider-Man isn’t drawn by Jack Kirby in this issue! Steve Ditko stepped in and drew Spidey. It’s pretty obvious when you look at it. A line of dialogue states that neither the Hulk nor Namor are available to appear in this issue. Sure enough, this month in their own titles, the Hulk was locked in battle with the Leader, and Namor was once again battling for the crown of Atlantis, this time against a bad guy named Krang (not the TMNT Krang, but a different one). 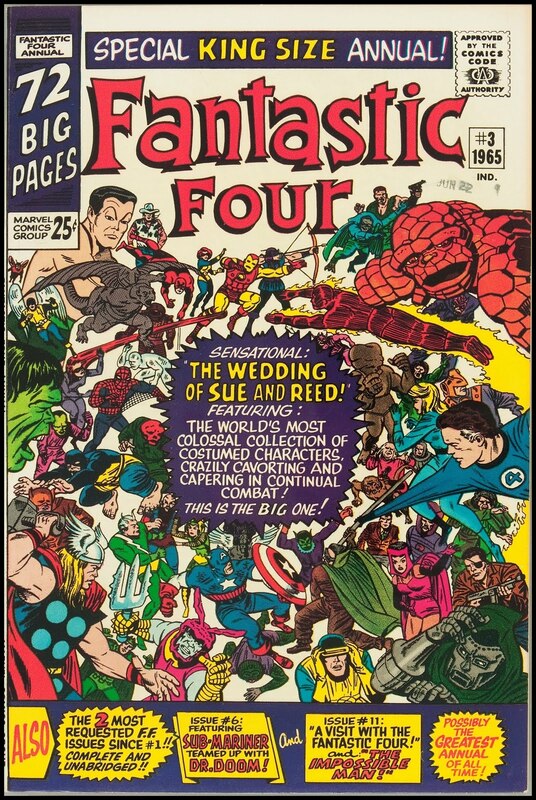 If there weren’t enough cameos in this issue, one panel features a character named Patsy Walker, and references another character named Minnie the Model. These two were stars of an Archie-style girls’ comic Marvel produced in the ‘50s. This was Patsy’s first appearance in the Marvel Universe, and she’ll later go on to get her own superhero makeover as Hellcat. Fantastic or Frightful: There are very few changes to characters in comics that last. Every time there’s a big change, such as a death, costume change, power change, or, in this case, a wedding, it’s usually retconned after a year or two, to return the characters to their “classic” forms. 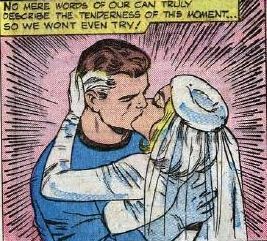 Reed and Sue’s marriage, on the other hand, has mostly lasted since this issue. (There have been a few separations here and there, but they always get back together, those two.) That makes this one worth reading, not to mention the fun of having so many Marvel characters in one comic. Next week: A C-lister gets his shot at the A-list.